We have now made the transition to the underwater scene. 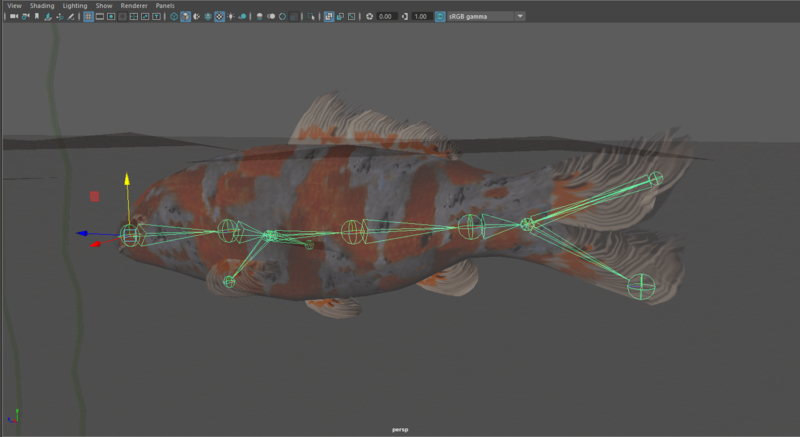 I animated the Koi fish on a path, and also animated his joints so that his spine and fins move as the shape moves along the motion path. I also found a tutorial on how to create a helix curve. This will be helpful when attaching the mandalas to the helix shape so they “dance” upwards. This isn’t too bad, except now that I have the mandala attached to the helix, I want to edit the timing. It should start around frame 90, not 150. I cannot figure out how to change the start/stop time of the motion path. I decided rather than one big spiral, I would do one for each of the seven lily pads. Here is the final animatic for this scene. 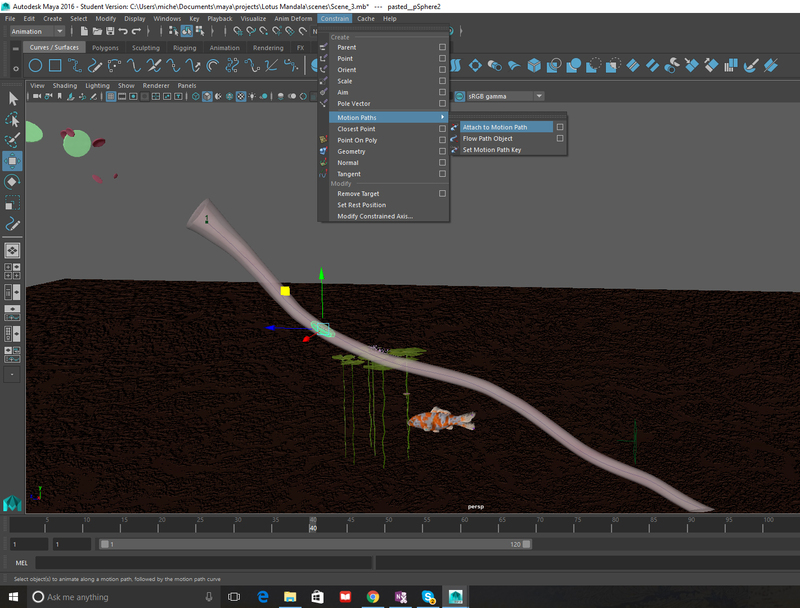 After some discussion about how to match scene 2 (where the medicine flows into the vein) to scene 3 (now we’re underwater) I decided to ditch scene 2 and use the underwater vein scene as the transition. The end of this scene would flow into the beginning of Scene 3, the transition to underwater. Here is a brief animatic of the first three scenes put together. 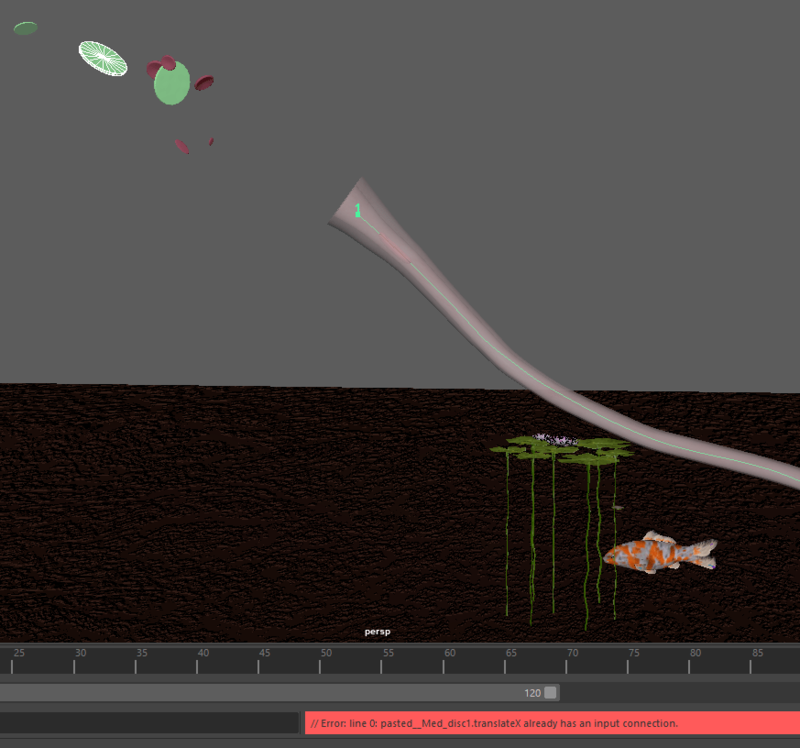 Today I worked on animating the flow of the “medicine” and blood cells through the vein in Scene 3, which transitions to the underwater scene. 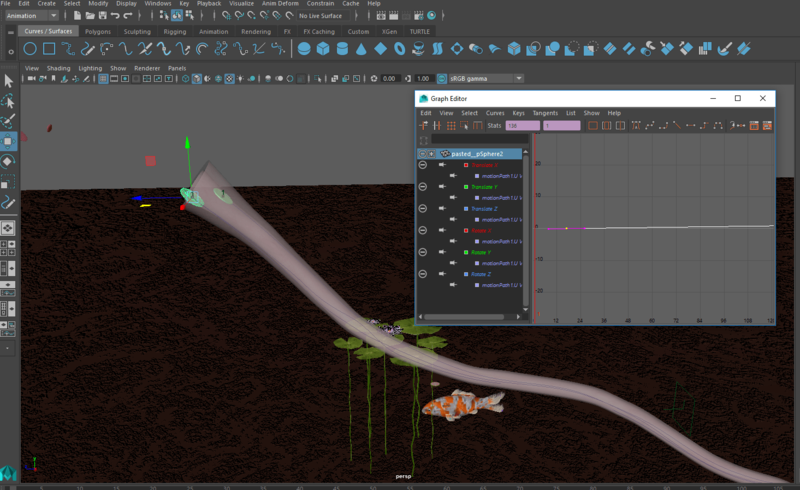 I attached the Koi fish to a motion path, so it moves through the scene. My next step is the give the fish more natural movement. For scene 3, I wanted to show the transition between focusing on the veins, and moving into the underwater scene. 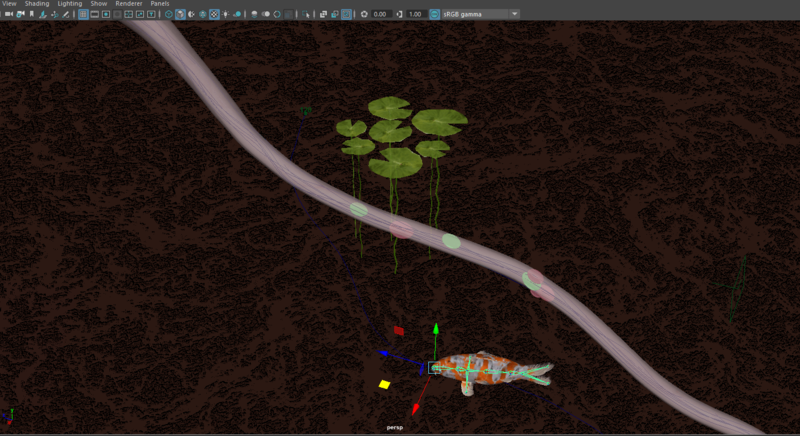 I copy/pasted the vein and discs from scene 2, and placed them in my underwater scene with the fish and lily pads. 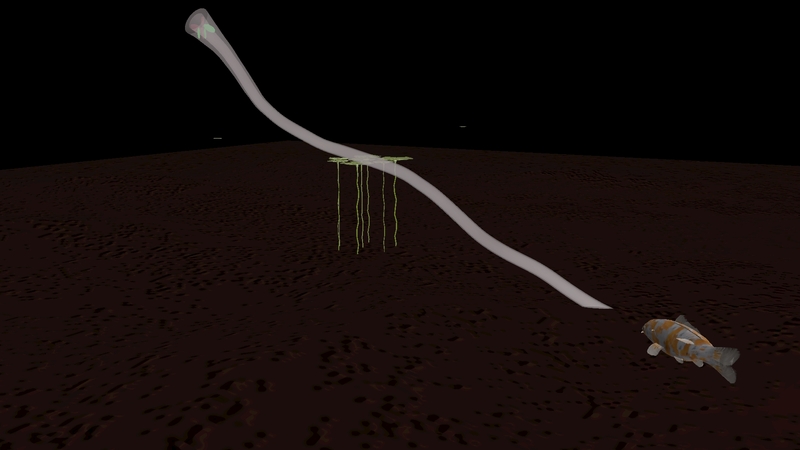 Next, I needed to animate the discs sliding through the vein. I attached the discs to a motion path. I tried attaching multiple discs to one path, but they all bunched up into one shape, or I received errors from Maya, so I duplicated the path and made a few tweaks to each one so it varied slightly. In the end, I wound up using multiple motion paths and the Hypergraph Editor to tweak how each one animated, so I could get some variation in speed over distance. 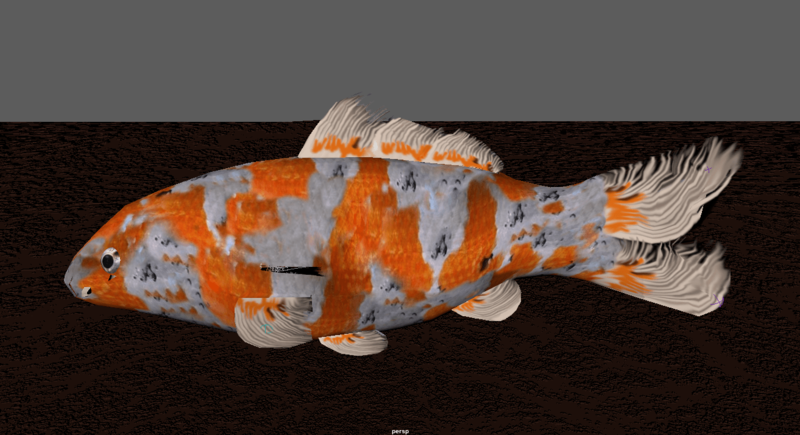 I spent a few hours fine-tuning the textures on the fish and adding eyeballs. 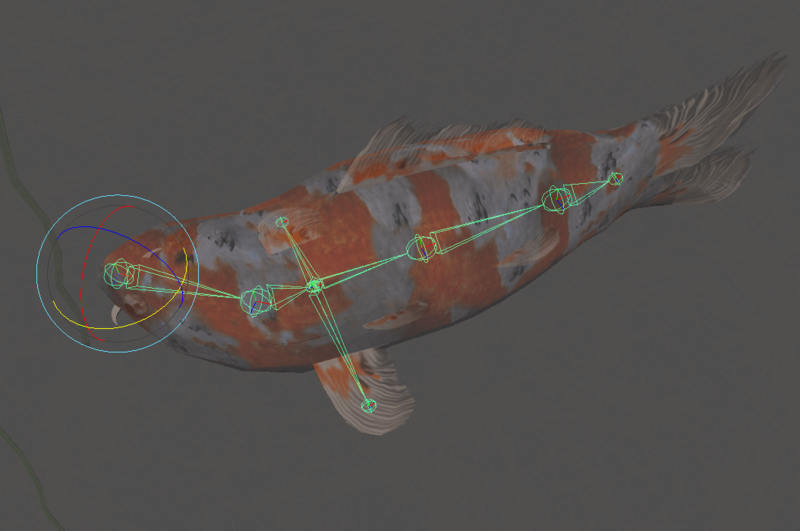 Afterwards I worked on putting bones inside the fish and binding the skin to the bones so it could move. Although I still have a ways to go, I wanted to be sure I understood the batch render process, and I was curious to see how my textures were actually looking with the animation. Maya doesn’t process the actual movie file. You have to batch render a sequence of stills, then open these up in Adobe After Effects to be rendered as a movie. I followed a good tutorial here. The veins needed to be visually softer, less realistic – less gruesome and more peaceful. I reworked the colors, and also added spinning discs to represent the medicine coming from the IV bag. My instructor pointed out that although I had done a lot of experimentation and learning, my hospital scene had gotten pretty far away from my original storyboard idea, and I needed to simplify. 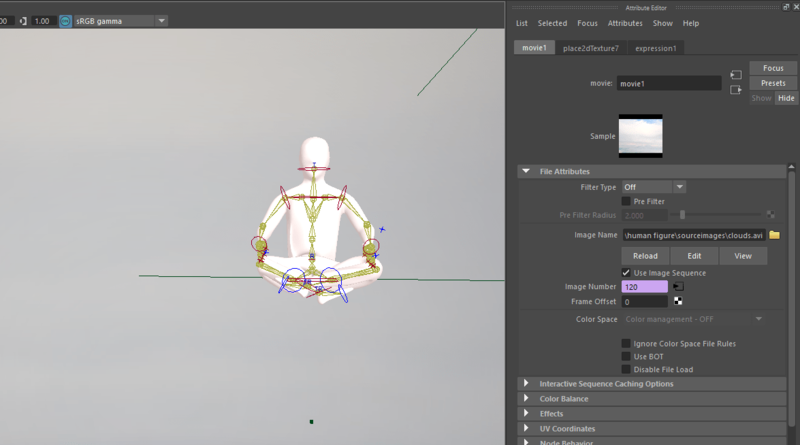 With that in mind, I worked on getting the figure from a standing pose to a lotus (cross-legged) pose. 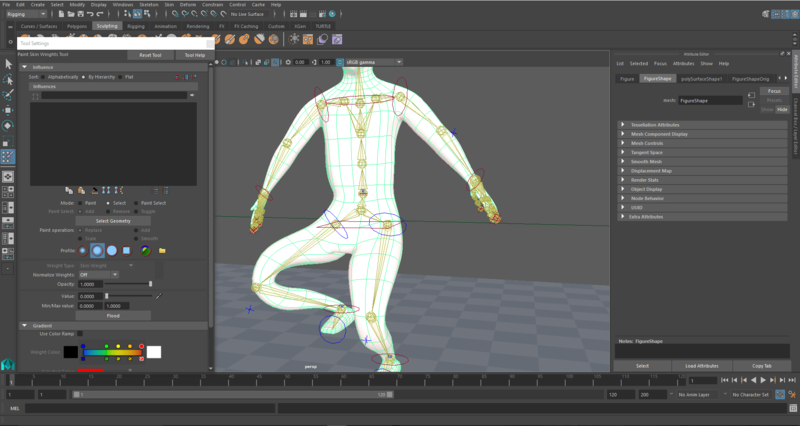 This was difficult at first, because I could not figure out how to get his knees to bend and lower properly. 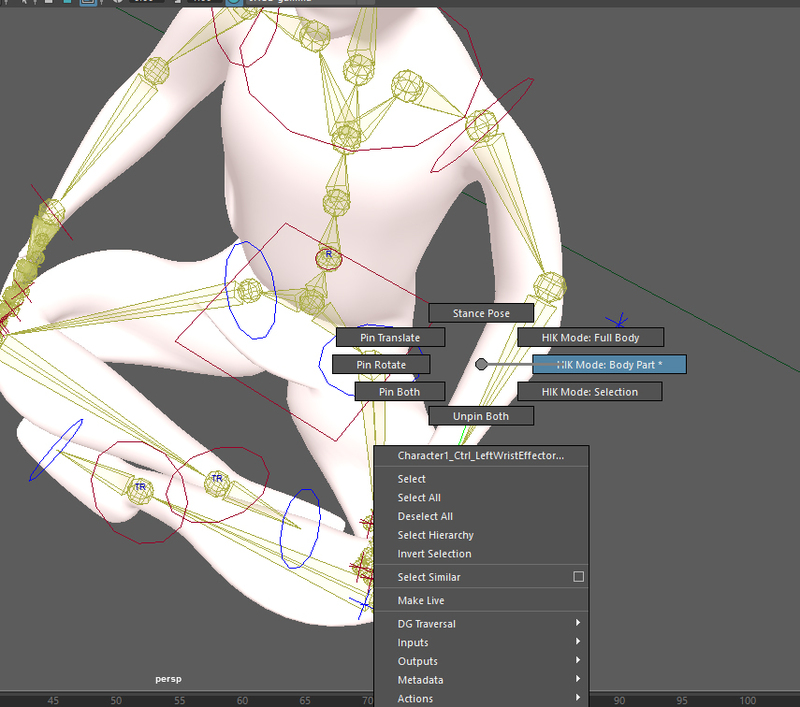 To select the knee area of the body, I had to right-click on that joint and choose “HK Mode Body Part” from the menu. 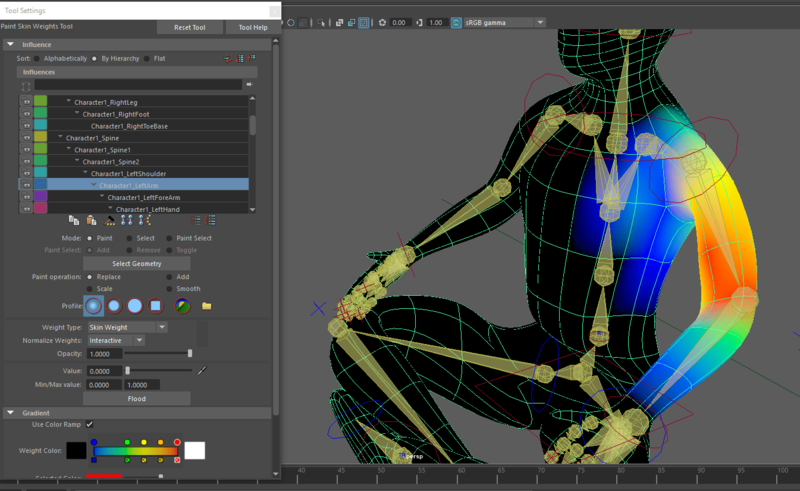 That allowed me to select an individual body part and move it. I was able to get the knees, elbows and hands into position. 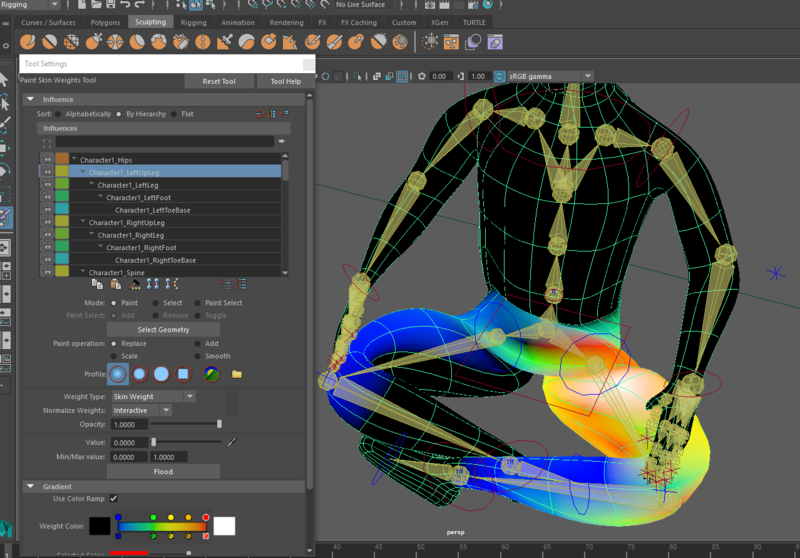 Because the Bones of the skeleton cause some strange deformations of the skin, you have to know how to “Paint Weights” for the skin to direct how much influence the bones have over the skin. This seems more art than science at this point; I am still struggling. Paint weights on the should don’t look too bad. 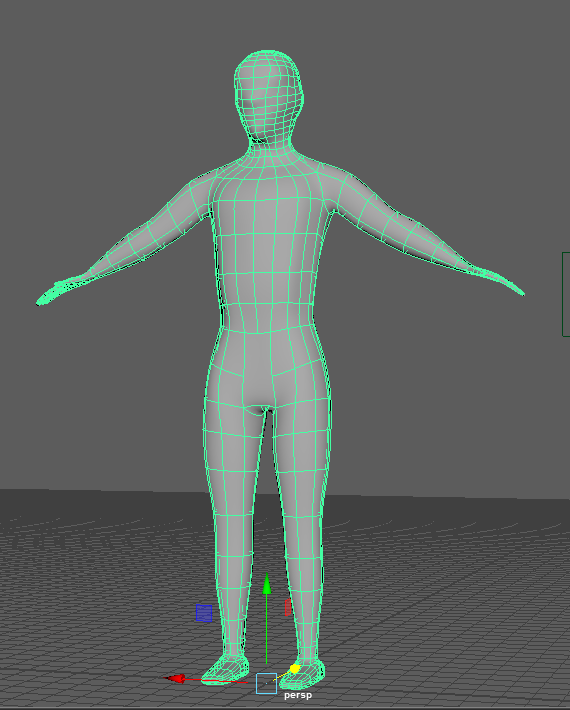 The leg and hips area need a lot more work. The bones in the hips are causing a strange deformation of the skin around the belly. The next thing I wanted to do was change the background into something serene and beautiful yet not distracting. 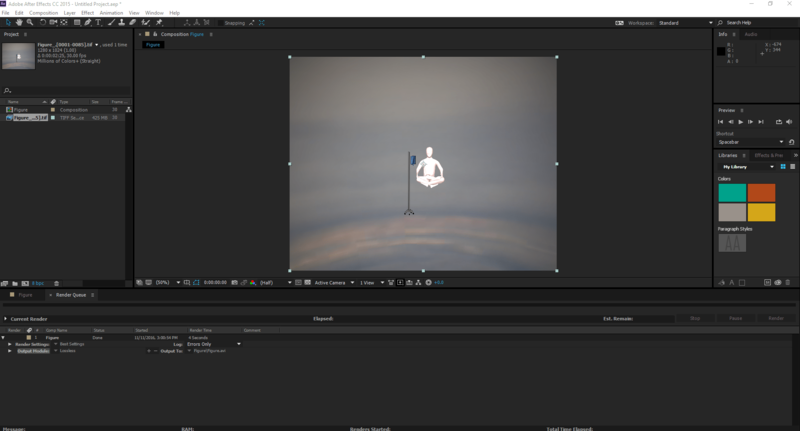 I found a tutorial on Youtube describing how to apply a movie as a texture, and I selected a motion graphic of clouds. I used Adobe Media Encoder to convert it to an AVI file. I followed the directions in the tutorial, but in my Playblast animation, the background does not animate, so I will need some help with this. Below is the playblast with the IV coming down from the bag. Also, I will remove the floor in the final scene. I simply forgot!